So -I haven't been to knitting groups or anywhere other than Taos for weeks. 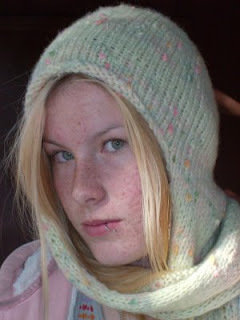 I have, however, been knitting and crocheting. 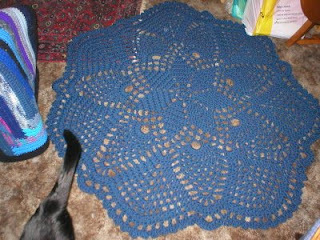 Here are all the things I've finished except a light sage colored rug for a wedding present. I'll get that picture this weekend. Hat w/attached scarf for Seattle charity. 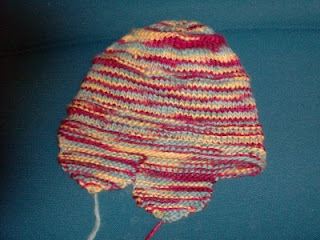 Hat for DD's schoolmate minus braids on top and earflaps. It's done and ready for pick-up. 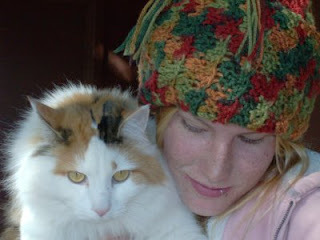 Sirocco coral cotton-linen towel/dresser scarf and crocheted hat (DD and Furball modelling) for Sarah-on-the-bus. 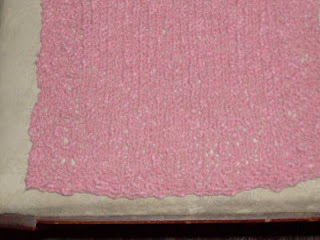 In the meantime here's a wedding present rug I made 'way back. I used navy because that's what I had and the recipient Loved it. The sage one is just like it but I used a smaller hook so it's a little more dense and smaller circumference -3 ft., instead of more.